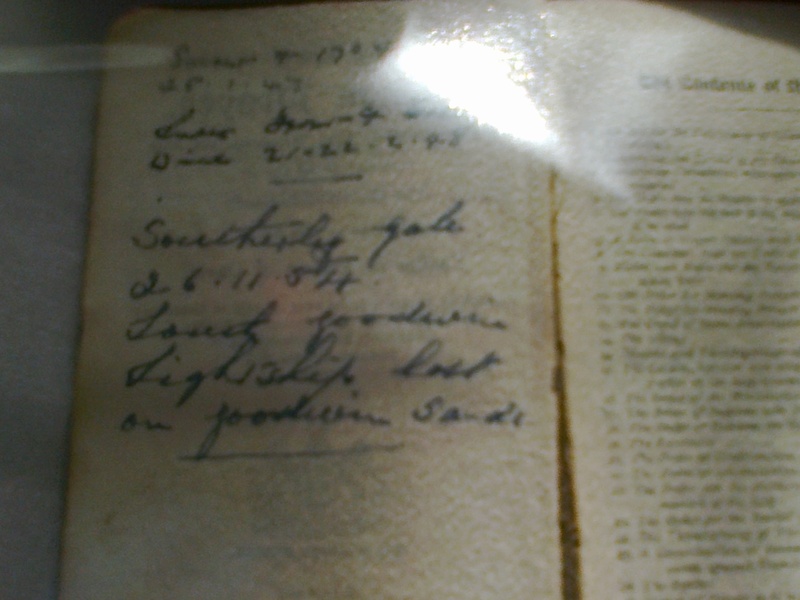 The owner of this Prayer Book made diary entries of significant events; you may just be able to make out the bottom entry ‘Southerly gale 28:11:54, South Goodwin Lightship lost on Goodwin Sands’. The Goodwin Sands is a treacherous sandbank off the east coast of Kent, in the Straits of Dover and ever since people first crossed the English Channel in boats, there have been shipwrecks here, including Viking longboats, galleons and liners. However on the night of Saturday, November 27th 1954, gales of 80 mph raged up the Channel and the South Goodwin Lightship, LV 90, broke from her anchors and became stranded on the Goodwin Sands. The lightship, as you can guess was like a floating lighthouse, positioned to warn shipping in the busiest strait in the world, of the very danger that the South Goodwin Lightship met herself. The captain was Tom Skipp, and no doubt on that dreadful night, he and his crew were doing all they could to keep the lightship steady and themselves safe. At about 1 o’clock in the morning the cable snapped and the ship broke free; nearby was its sister ship the East Goodwin Lightship LV12 and the crew saw LV90 had detached itself from its cable and was being swept away. There was nothing they could do. The LV90 foundered on the sands and fell on its side, trapping the crew beneath decks, all except one man who managed to get out of a skylight and hang on. Lifeboats from Dover and Ramsgate were launched into the foul night, and a helicopter from Manston tried to find the stricken vessel, and by some miracle it found the capsized lightship as dawn rose. The helicopter crew managed to rescue Ronald Murton, the sole survivor, but sadly the rest of the crew was lost and were never seen again. It must have been traumatic beyond imagining for Ronald as he knew that when he was lifted to safety, the crew were still alive and trapped inside. There are still traces of the lightship on the Goodwin Sands which can be seen when the tide is low enough. 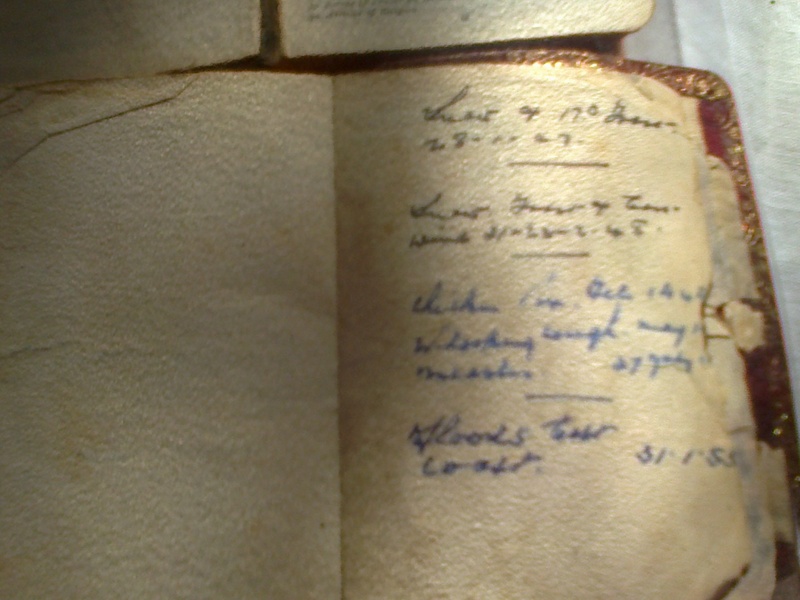 The ghastly news must have been broadcast on the radio and the owner of the Prayer Book, living so close to the sea and knowing what havoc bad weather could cause must have noted down the details.